Finally! You have accomplished it-you have created an amazing mobile app for your business. Now your customer can perform seamless integration with your business, and the data you are pulling from the app is helping you think of all kinds of new ways to market your brand. But, do you know, there is something else you can perform to make your mobile app even better for your business, and that is Monetization. Yup! That’s true! Your app can be so much more than a tool. It can be a solemn source of supplementary income for your business. By the time you will read this article, let us tell you that in-app advertising is the best way to make your app more monetizable. In-App Ads are the phenomenal opportunity for monetization. Digital advertising through mobile apps has enhanced communication between advertisers & consumers dramatically. This is mainly due to the vast amount of time people spend on their Smartphones. Now with In-App Advertisement- a simple thought come across the mind of app developers is to including ads in-app and get money on tap. But, According to Chocolate Platform’s research report, in-app video ads are highly monetizable than simple in-app ads. How In-App Video Ads are Voted As Best Monetization Strategy? Video has long proven its worth as a powerful & connective way to convey exciting content and turns consumers into loyal fans. So, it’s not a surprising element to find out that video ads are doing the same for the mobile marketers across the world. As of third quarter 2018, there are 4+ million apps in the world of which 90-94% are available for free. Thus, the question is how do these Freemium apps make money? The answer can be found in 3 alphabets – ‘Ads.’ By 2020, mobile apps are forecasted to generate about $189 billion in revenue through app stores & in-app advertising. Well, talking intensely, the In-app video ad is the new way for the app owners to make money from their apps. A video advertisement mediation platform “Chocolate Platform” has given the vote in favor of in-app video ads. It was stated that mobile ads are one of the most favorable monetization technique for app developers. And, mostly gaming app developers prefer this medium of advertisement. 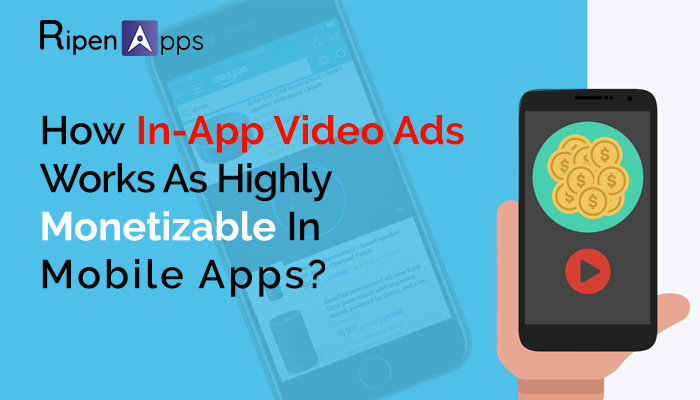 Apart from in-app advertisement, there are more ways to earn money from apps, but all the ways have been lost the battle in a comparison of in-app video ads. As per the above stats, a clear difference and hike have been shown. 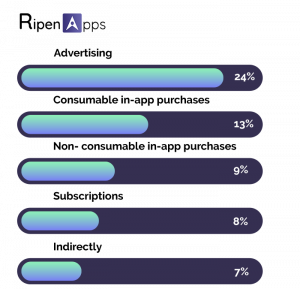 The highest rating of 24% as a top business model for mobile app developers and mobile app development companies was received by advertising category. And other app monetization categories like in-app purchases, subscriptions & indirect mediums were close behind in the line. In-App video ads have contributed to a 20-30% increase in app revenues for most app developers. The decision of picking the best video ad format must be based on an analysis of the user behavior & the developer’s goal. The aim should be to gather as much data to understand the interests & demographics of users. This helps in zeroing on the most effective mix of video ad formats, frequency, placements & caching to figure out the best options for your app. In Rewarded Video Ads, users opt-in to watch an ad in exchange for rewards like more gaming life, unlocking next game level, etc. Rewarded video ads generate positive user experience & higher engagement rates. Playable Video Ads create an interactive moment such that the ad seems natural & offers an enjoyable experience to the user without downloading. Mobile app developers get to create a long-lasting, meaningful interaction with these users’ opted ads. Full-Screen Video Ads also known as interstitial ads, it appears at the natural transition point of the app. These types of ads efficiently manage user satisfaction levels by delivering the obstructive experience. In-app video ads are increasingly growing and used to drive more user engagement, buzz & download in the mobile app economy. In-App video ads cut down on wasted efforts and spend because users know precisely what they are getting into it. It is a preconceived idea in people around what the user experience can be and so users are more likely to play or interact with the app until they get that experience. Well-Designed In-app video ads can quickly grab the attention of the users with its naturalist and engaging qualities, which make users, connected to the feel and forced them to tap on the ad and unlock the door of revenue. User experience is taking a dominant role. The right ads, at the right time, for the right audience defines app monetization success. In-App video ads are effective ways to enhance the user experience and a mobile app owner if your app is qualifying the user experience level promisingly then all doors of money will be unlocked for you. There are specific ads providers in the market that are specialized for particular app platforms or the third party. AdMob: AdMob is recognized to be the top tech-giant mobile ad network from Google. An Android developer could leverage the power to earn more money by implementing the video ads in Android apps under the coverage of AdMob. iAd: An iOS app developer could leverage the power to earn more money by implementing the video ads in Android apps under the coverage of iAd. If you’d like to promote your apps, you can advertise using Search Ads, Apple News, or third-party networks and advertising sellers. InMobi: InMobi has come up with a great option to target users that come to be known as Appographic targeting. Appographic targeting enhances the chances to connect users to the kind of apps and media, which are most likely to consume. Not every app development company or mobile app developer will be able to create in-app videos of that standard straight away. But by putting time, money and effort into video ads, your company can benefit from an engaging format that delivers returns for UA experts, social marketers and the brand of the company as a whole in the long term. Ads are adding money to the business, and we are adding value to your business. To avail more information regarding implementation of in-app video ads, our team of talented giants is always ready to share their insights with you. Simply drop a mail at sales@ripenapps.com and get the more out of more.